The ways in which we tell others about disc golf and work to grow the sport vary quite a bit - sometimes we’ll bring our discs with us to work and invite a co-worker to play a round after clocking out. Other times, people drag their friends or partners out onto the course whether they want to come or not! For a bit of a belated Grow Disc Golf Day this year, one couple in Tulsa, OK decided to use their passion for the sport to not only start their own business but to make November 4th a special day for their community. We talked with Amy, one of the owners of Basketcase Disc Golf to find out a little more. The solution to their problem came in the form of opening up Tulsa’s only all disc golf store, and when Kent and Amy saw an opportunity to do something for Grow Disc Golf Day, they jumped at the chance. 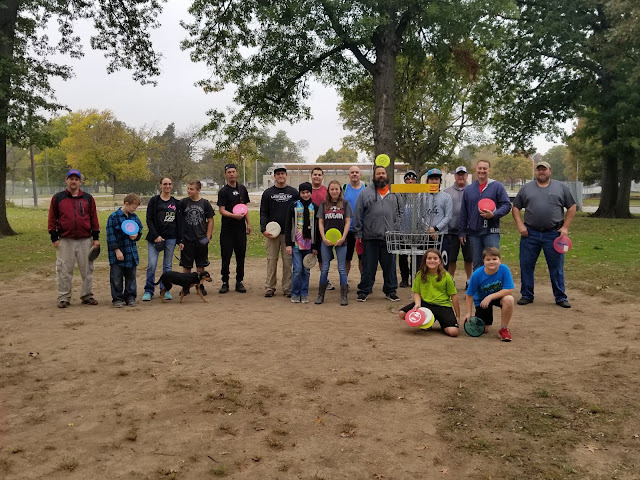 With a passion to promote disc golf to anyone and everyone, Kent and Amy organized a clinic at McClure Park in Tulsa, inviting those who came out to learn how to play and rewarding them with a free disc for trying it out. Pro players Devan Owens and Tim Mirabal were in attendance, putting on in-depth clinics that showed attendees how to drive, putt, and throw midrange discs with ease. Not only did they host this awesome clinic on the 4th, but their follow up event on November 18th will continue to work with players who are interested in learning more about the sport and improving their skills. Share with us how you spent time during Grow Disc Golf Day to spread the love of our sport to others. We’d love to hear your creative ideas for getting disc golf into the minds and hearts of everyone!